Sept. 03, 2014. Celebration for Kartik PhD defense. 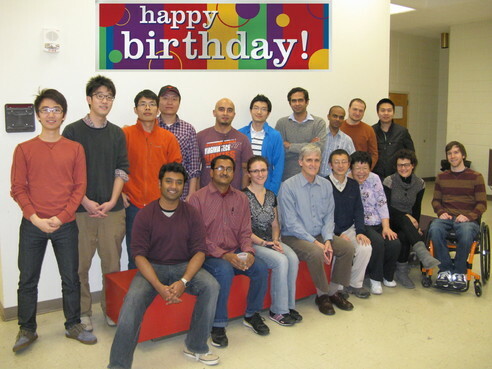 Kartik Subramanian, Suddy Murari, Prof. Jianhua Xing, Prof. Yang Cao, Prof. John Tyson, and friends and colleagues. May 29, 2014. Farewell to Alida Palmisano, Cihan Oguz, and Chun Chen. 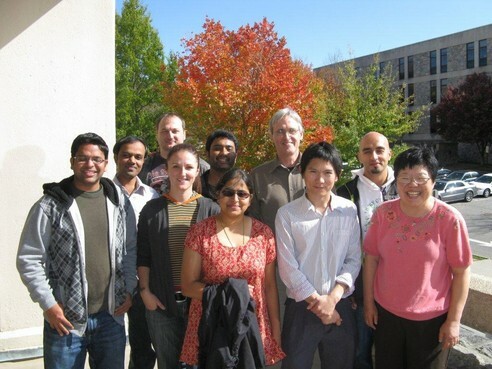 (left) Kathy Chen, Prof. John Tyson, Prof. Cliff Shaffer, Prof. Layne Watson, Kartik Subramanian, Chun Chen. Cihan Oguz and Alida Palmisano. (not pictured) Pavel Kraikivski, Jignesh Parmar and T.C. Jones. April 23, 2014. Reunion with Jason Zwolak. 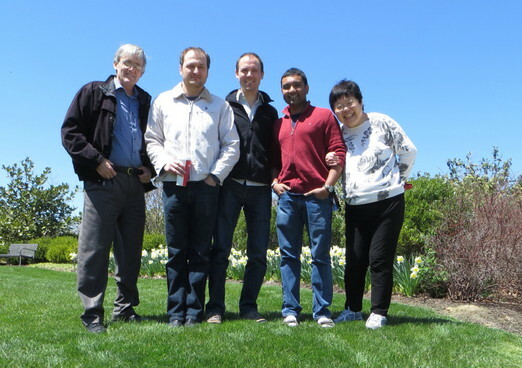 (left, front) Prof. John Tyson, Pavel Kraikivski, Jason Zwolak, Kartik Subramanian,and Kathy Chen. April 09, 2014. Belated Celebration of Chun Chen's Ph.D. thesis defense. 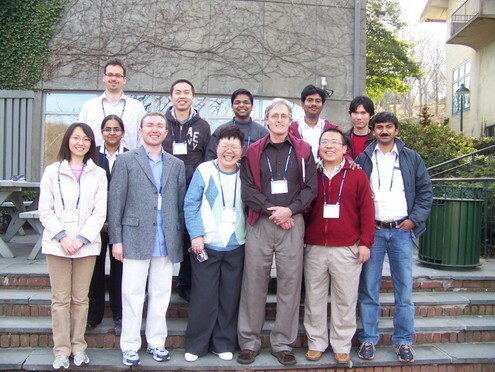 (left, front) Kartik Subramanian, Prof. Bill Baumann, Kathy Chen, Prof. John Tyson, Chun's wife Lingling, Cihan Oguz, Alida Palmisano, Jignesh Parmar, T.C. Jones, Pavel Kraikivski and Chun Chen. July 25, 2013. Celebration of Iman Tavassoly's Ph.D. thesis defense. Second celebration in the month of July. 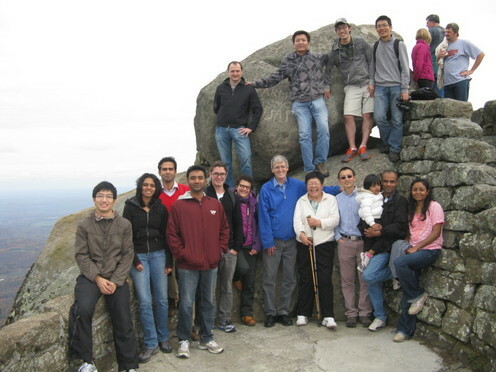 (left, front) Pavel Kraikivski and son Kiryll, Kartik Subramanian, Tian Hong, Iman's friend, Iman's wife Elnaz, Iman Tavassoly, Kathy Chen, Chun Chen, Prof. John Tyson, Jignesh Parmar, Cihan Oguz, Alida Palmisano, and T.C. Jones. July 9, 2013. 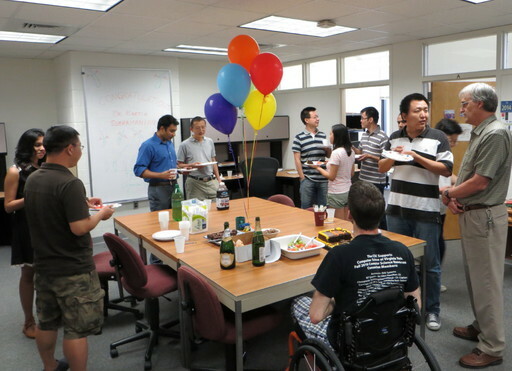 Celebration of Tian Hong's Ph.D. thesis defense. 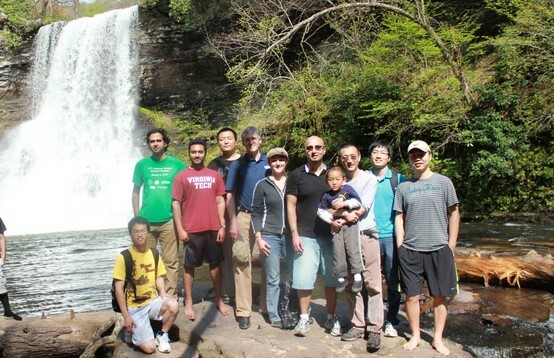 (left, front) Pavel Kraikivski, Iman Tavassoly, Prof. Layne Watson, Jignesh Parmar, Kartik Subramanian, Prof. Liwu Li, Tian Hong, Prof. John Tyson, Cihan Oguz, Kathy Chen, Debasish Mondal (Prof. Xing's Postdoc), Hang Zhang (Xing's student), and Xiaojun Tian (Xing's Postdoc). Dec 12, 2012. Celebration of John's 65th birthday. 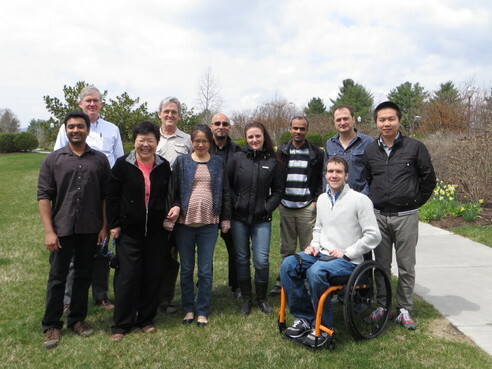 (left, front) Kartik Subramanian, Debasish Mondal (Prof. Xing's Postdoc), Alida Palmisano, Prof. John Tyson, Prof. Jianhua Xing, Kathy Chen, Chiara Fornari, and T.C. Jones. (back) Jingren Deng (Xing's student on rotation),Peter Sung (Xing's student), Xiaojun Tian (Xing's Postdoc), Hang Zhang (Xing's student), Cihan Oguz, Tian Hong, Iman Tavassoly, Jignesh Parmar, Pavel Kraikivski, and Chun Chen. Oct 26, 2012. Hikng to Peaks of Otter, Blue Ridge Parkway. 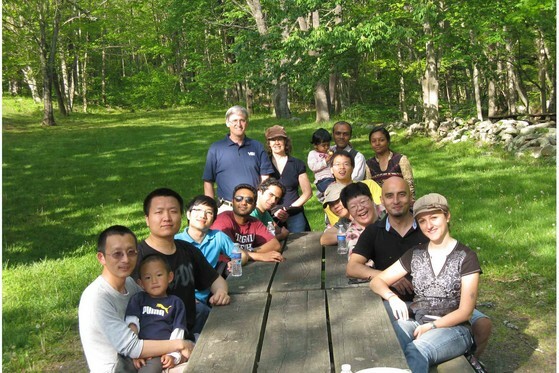 (left, front) Tian Hong, Suddy Murari, Iman Tavassoly, Kartik Subramanian, Kenneth Nielsen, Chiara Fornari, Prof. John Tyson, Kathy Chen, Prof. Jianhua Xing, Jignesh Parmar with daughter Shreya and wife Hetal. (back) Pavel Kraikivski, Hang Zhang and Peter Sung (both are Xing's students) and Xiaojun Tian (Xing's Postdoc). April 29, 2012. Hikng to Cascades Fall, Jefferson National Forest. April 29, 2012. At the Cascades Fall, Jefferson National Forest. Tian Hong, and Chun Chen. Dec 01, 2011. Celebration for Janani's PhD defense. Front row: (left) Oak T. Laomettachit, Kathy Chen, Janani Ravi, Cihan Oguz, Alida Palmisano, and Jignesh Parmar. Back row: (left) Prof. John Tyson, Rajat Singhania, Prof. Bill Baumann, Pavel Kraikiaski, and Tian Hong. Dec 01, 2011. Celebration for Janani's PhD defense with her family and friends. Front row: (left) Oak T. Laomettachit, Prof. Jianhua Xing, Yan Fu (Dr. Xing's graduate student), Kathy Chen, Mrs. Ravi (Janani's mother), Janani Ravi, Cihan Oguz, Alida Palmisano, and Jignesh Parmar. 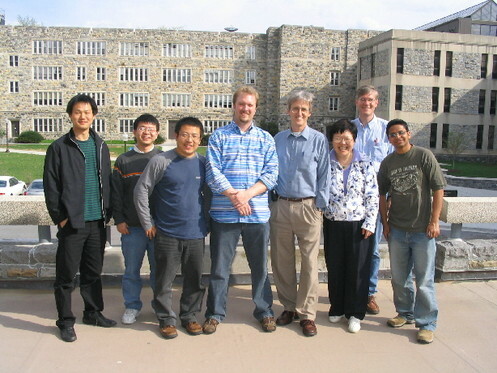 Back row: (left) Arjun Krishnan (Janani's husband), Rajat Singhania, Xiaoshan Jiang and Hang Zhang (both are Dr. Xing's graduate students), Prof. John Tyson, Prof. Bill Baumann, Pavel Kraikiaski, and Tian Hong. Oct. 24 2011. Celebration for Oak's PhD defense. Front Row: (left) Rajat Singhania, Alida Palmisano, Janani Ravi, Oak T. Laomettachit, and Kathy Chen. Back Row: (left) Jignesh Parmar, Pavel Kraikivski, Kartik Subramanian, Prof. John Tyson, and Cihan Oguz. Dec 2010. Celebration of John's birthday. Front Row: Oak T. Laomettachit, Kathy Chen, Yan Fu (Prof. Xing's graduate student), Janani Ravi, Kartik Subramanian, Anael Verdugo, and Prof. Yang Cao. Back Row: Prof. John Tyson, Rajat Singhania, Baris Hancioglu, Arjun Krishnan (Janani's fiance, they will be married on February 19, 2011), Zhanghan Wu (Prof. Xing's graduate student) and Bryce Wen-Hsien Lin. Dec 2009. Celebration of John's birthday. Front Row: Umme Mobassera, Janani Ravi, Kathy Chen, Yan Fu (Dr. Xing's graduate student), Ling-Ling Chen (wife of Chun Chen). 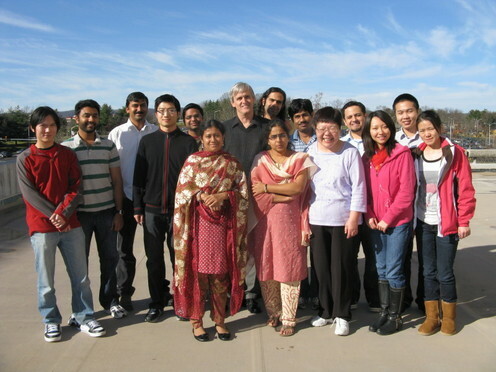 Middle Row: Oak T. Laomettachit, Tian Hong, John Tyson, Sandip Kar, Anael Verdugo, Chun Chen. Back Row: Kartik Subramanian, Debashis Barik, Rajat Singhania, and Iman Tavassoly. Fall 2009. Group picture of Tyson's Lab. March 2009. Computational Cell Biology Meeting at CSHL. Oct. 2008. 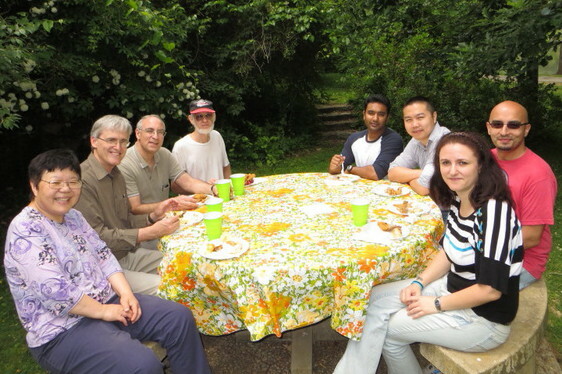 Celebration of Tongli's and Shenghua's PhD and farewell to Suman. April 2007. Welcome new postdocs Debashis, Sandip and Zerrin. Sept. 2003. Bela Novak's visit.